The Tom Brown Tracker (currently produced by Tops) with its distinctive profile is probably one of the easiest knives to pick out from a lineup of survival knives. 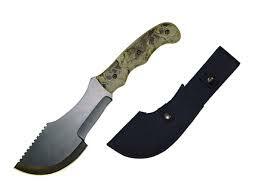 The knife was featured in the movie The Hunted starring Tommy Lee Jones and became a celebrity knife. They normally sell for around $230. For this you get a certificate of authenticity, a 1095 carbon steel blade with an HRC of 58, full tang construction and detachable linen Micarta handles. All of this fits into a black Kydex sheath with swiveling metal belt attachments. Of course if you want to spend less, there are copy cats of the Tom Brown for around $10-20. These copycats are not officially licensed movie copies. The copy cats have the black coated stainless steel blade of an unknown HRC; with the exact same profile. In place of Micarta you get detachable wood handles. 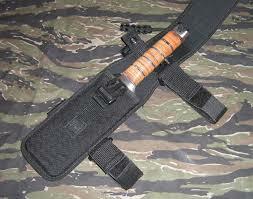 And instead of Kydex, you get a ballistic nylon sheath. The one copy cat I’ve seen calls itself the “Enforcer Tracker”. I assume the company name is Enforcer but I’m not sure. Country of origin is assumed China but again I’m not sure. Then there is the Rough Rider Saigon Sidekick (RR1093). While it is obviously influenced by the Tracker design; it is not a direct rip off., I don’t feel it tries to copy it or pretend to be a Tracker. There are distinct outward differences that make it easy to tell the knives apart. Despite all of this, there is also no way to describe the Saigon Sidekick without comparing it to the Tracker. But let’s face it. I’m a big Rough Rider fan. If you want to call it a rip off -- go for it. Four cutting edges with a V grind* to the cutting edge. The bottom edge has a slightly concave curve near the handle used for hacking followed by large convex curve making a full 90 degree swoop to the spine at the tip used for cutting.. It has a notch separating the two edges used for cutting wire. The front 2/3 of the spine is a saw blade with deep, sharp saw teeth. Made of 1095 carbon steel, full tang construction with removable Micarta handles attached with hex screws. Price: Between $175-300 depending on dealer and shipping. * as I do not own a Tracker, I am unable to verify that the blade is really a V grind. Bottom edge of blade is similar to the Tom Brown Tracker. Top edge has a shorter saw with a single row of teeth on the saw. Wood handles attached to a 440 Stainless steel frame with hex screws. All painted black. (also offered with a camo handle). Price: Between $8-20.00 depending on dealer and shipping. It has a 440 stainless steel hollow ground blade; the bottom edge lacks the notch for wire cutting. Hacking edge of the Tracker is moved to the top of the Sidekick, between saw blade and cross guard. A rat tail tang passes through the leather washers and is pinned to a stainless steel pommel. It has a stainless steel cross-guard between blade and stacked leather grip. Price: Between $20-35 depending on dealer and shipping. Side by side size comparison with an Ontario Air Force Survival Knife. As with most Rough Rider knives, the blade is made from 440A stainless steel which is hardened to an HRC of around 56. A quick check with the ruler put the blade right at 6.75 inches, with the bottom blade edge at least that much; if you were to measure along the curve. The blade is just shy of being a ¼ inch thick at the spine and where the tang enters the handle. Being 440 stainless, It is not going to retain an edge as well as the 1095 carbon steel blade of the Tracker; nor will it be as durable. The lower cutting surface is one continuous cutting edge from ricasso to tip. (The Tom Brown Tracker has a notch about two inches up from the ricasso used for cutting wire and such. The Sidekick lacks this feature). The spine of the blade has both the saw blade at the front and the hacking/splitting blade near the handle. The blade finish is polished stainless steel. The obverse side has a blade etch of a Huey Helicopter and the words Saigon Sidekick. The cutting edge is not what you would call “Razor Sharp” but it is plenty sharp enough to do some major damage and could easily cleave through a side of beef, heavy brush, or similar material. The hacking (axe) edge that runs along the spine made short work of splitting up some 2X4 with no problem whatsoever. It would handle most camp chores that require making kindling. Of course with the opposite side being the knife blade edge there is no way to pound the axe edge into the wood. Both RR-SS and the TB Tracker have this drawback. Whereas the Tracker’s blade has a V grind the Sidekick has a hollow ground blade . Being old School I prefer hollow grinding. I’m sure many will debate the merits of the V grind. I’m not one of them. The saw edge is as effective as the one found on other survival knives. It consists of two rows of triangular cutting teeth. Being almost a ¼ inch thick and around 2 inch long makes it about as useful as it sounds. It has always seemed, that whatever you’re wanting me to cut with a saw blade on a knife could just as easily split a couple good hacks of the knife blade. I’m aware that this type of saw blade is similar to that on the Air Force survival knife and is designed to cut Plexiglas, aluminum and wood. I’m sure it will do it. I’m just not sure it will do it quickly or any better than simple brute force and bashing. Maybe some survivalist will clue me into to its usefulness as so many survival knives have this feature. I think a nice serrated edge in place of the saw may have been a better touch. I’m sure others will be quite pleased with the saw. All in all, I give the blade high marks. It is time to move on to the handle The grip is what really sets this knife apart from the Tracker, at least when it comes outward appearance. First off, this handle is fully 6 inches long. The handle comprises a stacked leather grip set between a guard and pommel made of 440 Stainless Steel. A nice 550 Para-cord lanyard is attached via a lanyard hole in the pommel. Between the steel and stacked leather are three plastic pacers in alternating black/red/black colors. Three other black spacers are spaced equal distances along the handle adding recessed groves in the nicely finished stacked leather washers. As far as I can tell; the knife is full tang construction with the steel pommel locking the handle in place. The pommel is obviously designed to be used as a hammer and I believe it is up to the task but I have not tried to make little rocks out of big one with it. I’m sure it could crack a skull if the need to do so came up. It put some good dents in a piece of plywood. Did I mention the overall weight? Being made of an almost ¼ inch thick slab of steel and stacked leather washers, the knife has some serious heft to it. The six inch long handle provides some counter balance to the wide blade. It also allows the user to grip the knife in different ways to make better use of the blade as a brush clearer or wood splitter. The shape of the cross bar also make it easy to position your thumb along the top (or bottom) of the knife when gripping the knife at the back of the pommel. As I move on to the sheath, let me first say, I’ve yet to find a sheath that I didn’t think could be better. 95% of the people who buy this knife are going to really like it and say I’m just too nit-picky. I admit it. I am. Keep this in mind while you read my review of the sheath. The sheath is made of Cordura nylon and has a plastic insert which secures the blade and prevents it from cutting into the nylon. For the most part, this style of sheath seems to fit this knife quite well: a modern knife with a modern sheath. My first complaint is the big flap that covers the handle. It gets in the way when you are trying to draw the knife. On the plus side is it gives you a second securing device and protects the knife from heavy brush. This big flap also makes the sheath “jump certified”. It’s a trade off. If you’re going to jump with the knife you will want it. I just wish there was a way to secure it out of the way when you’re not or if you don’t jump from an airplane. The sheath has four plastic belt hooks, two on each side and allow two nylon straps (also provided) to pass through them, allowing the knife to be strapped to a leg. The provided straps are secured with Velcro and have a small elastic band in the middle to allow a certain amount of give. In my case, the straps are too short unless I want to attach the knife to my calf. I know many people like the use of leg straps but I’ve never been a major fan of strapping a knife to my leg. I've walked through too many swamps and like to keep my knife high and dry if at all possible. Still the belt loops can come in handy and really does increase the various carry options. As I said, most will be very pleased. A single belt loop is located on the back of the sheath. The back loop is large enough for about a two inch belt but not large enough to fit on the old U. S. Army issue web belts. This is probably my biggest disappoint with the sheath -- I want a belt loop large enough to attach the sheath to a web belt. As I mentioned, the sheath has a plastic insert in which the knife fits. Many people are wary of these plastic sheaths, fearing they will fall apart quickly. This has not been experience. The rectangular plastic insert fits snuggly inside the rectangular sheath and at first glance you’d think the knife can be inserted either way, for left or right hand draw. This is not the case. The knife can only go in one way. While this may seem like a disappointment, it isn’t. Because the knife can only go in one way, it doesn’t move all over the place which helps protect the sheath from wear and tear. However, the sheath is rectangular, and the plastic insert can easily be slid out and flipped over making it possible to set up the sheath for left or right hand draw. This is a major plus for a left-hander like me. In all, the sheath is really quite good and most people will be very happy with it. However, I wanted something a little more special and a little more versatile. I also wanted something that would tie in more closely to the "Saigon Sidekick" blade etch which is brings up memories of the Vietnam War. For this reason I made a new "Tiger Stripe Sheath" which can be viewed at this link. If you want a Tracker, this isn’t it. If you want to buy a copy-cat Tracker; there is one out there but this isn’t it. Some may think the Saigon Sidekick is s pretending to be a tracker, but I’m not in that camp. It has a tough 440A stainless steel blade that is going to handle most camp duties. It will most certainly take out the occasional zombie. It is also so sharp that you could easily take off a digit or two if you’re not careful. This is not a toy. It is a real tool that could easily be a deadly weapon. Would it save your life in survival situation? I would say it has the chops to do that but you would be about ten times better off with the original tracker, which incidentally is about the difference in price! My only real dislike on the knife is the Saigon Sidekick blade etch. While I think it is a cool design, it seems unnecessary and misleading. I’ve tried to find a relationship between this knife and the Vietnam Conflict and have been unable to do so. 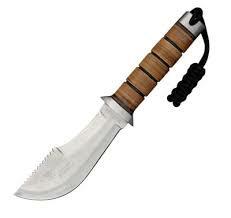 If this or a similar style knife was used in Vietnam, I’d like to find out the history of its use in Vietnam. I like the way the knife handles, I like the way it looks. I was very much impressed with its overall heft, weight, and size. I’m sure I’m not the only one who’d like to see Rough Rider make this with SK-5 or 1095 carbon steel to make them more durable and reliable. I’d pay double or triple for that and it would give the Tracker a serious run for the money. I think it would also look awesome in Damascus, but then it would truly just be a zombie hacker. Still, at the end of the day, the Saigon Sidekick is a darn good camp knife with plenty of punch that, if push came to shove, would be there for you in a survival situation. It also looks pretty dang cool. Hard to ask for more when the price tag is just $20. Finally, if you decide you really want a Tom Brown Tracker, go with a reputable dealer and make sure it is serial numbered and comes with a certificate of authenticity. People do pass off “Fake Trackers” as the real deal! Bail or lanyard: Lanyard hole with short 550 Paracord lanyard. Sheath: Ballistic nylon, jump certified, with multiple carry options.